This first panorama from the surface of Comet 67P/Churyumov–Gerasimenko was captured by the Philae lander on Nov. 12, 2014 after its historic landing during the European Space Agency's Rosetta mission. ESA released the image Nov. 13 to show its first glimpses ever from the surface of a comet. The European Space Agency's Philae probe landed on the Comet 67P/Churyumov-Gerasimenko not once or twice, but three times, when its anchor system failed to fire. But despite that, the probe is healthy and beaming back stunning photos of its new home. European Space Agency (ESA) officials still aren't exactly sure where the Rosetta spacecraft's lander, called Philae, ended up after bouncing on the surface of Comet 67P/C-G twice before finally settling down. At the moment, officials think the lander — which was released down to the comet from the Rosetta orbiter Wednesday (Nov. 12) — is in a potentially precarious position away from its initial touchdown site. The new comet surface photos from Philae, released by ESA today, show the lander shadowed by what appears to be some kind of cliff. This photo from the European Space Agency is the Philae lander's view of its landing site on Comet 67P/C-G's surface. Image release Nov. 13, 2014. The European Rosetta spacecraft's Philae lander aims to be the first probe ever to safely land on a comet. Here's how to land on a spinning ice mountain in space. 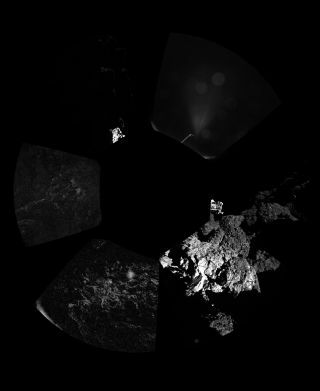 The new photos represent the first-ever pictures taken by a probe from the surface of a comet. Philae landed on the comet as the icy object, the lander and Rosetta were speeding across deep space at more than 11,000 mph (17,702 k/h). Philae's harpoon system, meant to fire just after landing, did not deploy when Philae got to the comet's surface, and officials with the mission are not sure if they want to try re-firing them now. Officials are worried that, if the harpoons don't fire properly, they might cause the spacecraft to jump again. Mission controllers now think that Philae could have bounced as far as 1 kilometer (0.6 miles) into space before making its second landing. The spacecraft then bounced away from the surface again on a shorter jump before coming to a rest in its current position, officials said today. Officials are planning on trying to find Philae's spot on the comet's surface in images its mothership Rosetta took from the comet's orbit. One of Philae's three landing legs could be off the surface of the comet, so mission operators are still trying to understand exactly how the lander is positioned on the comet's surface. ESA officials still aren't sure whether Philae's drill instrument (designed to investigate the composition of the comet's surface) will work properly in the lander's current position. "We are also hesitant to, in the next hour or days, to activate the drill because drilling without being anchored, and without knowing how you are [positioned] on the surface, is dangerous," Stephan Ulamec, Philae lander manager at the DLR German Aerospace Center, said during the news conference. "We might just tip over our lander." Scientists also think that the lander is not getting enough sunlight from its currently shadowed position, and that could reduce the life of the lander on Comet 67P/C-G's surface. Instead of the 6 to 7 hours of sunlight expected at the first landing site, Philae is only receiving about 1.5 hours of sunlight on its solar panels in the new spot, ESA officials said. But scientists working with the mission are still hopeful. "Even if we think the mission ends because the first science sequence may end, and the batteries are low, the lander is not necessarily dead," Ulamec said. It's possible that the lander could go into hibernation mode and wake up again when it gets more sunlight, but it's also possible that might not happen, he added. The Rosetta spacecraft and Philae lander arrived at Comet 67P/C-G in August 2014 after launching to space in 2004. Rosetta is expected to stay with the comet, studying it until December 2015.